Tomorrow is bread making day: brioche, "pains au lait" for breakfast, ciabatta and I wanted to be ready to have something to spread on our breads when they came out of the oven. 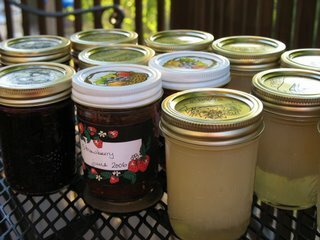 There it is: strawberry-rhubarb jam, blueberry jam and coconut honey (which separates while cooling, but is so good on croissants and such). The recipe for the Coconut Honey comes from A Spoonful of Sugar and is really easy to make. The difference with hers is that I like to make mine on the stove and let it boil/cook for the same length of time. It is delicious. Place all the ingredients in a 2.25L bowl (I used a 3L bowl, I'd suggest using this size or larger as it will boil) and stir well. Leave uncovered and cook on full power (750 - 800W depending on your microwave settings) for 18 minutes. Stir four times during this cooking period. Reduce the power to Medium (550W or as close as possible depending on your settings - I had to use 450W and extended the cooking time) and cook for 25-30 minutes, stirring four times, until the mixture is thick and curdlike. Allow to cool to lukewarm (it will thicken even more on cooling) and ladle into warmed jars. Top with waxed discs and leave until cold. 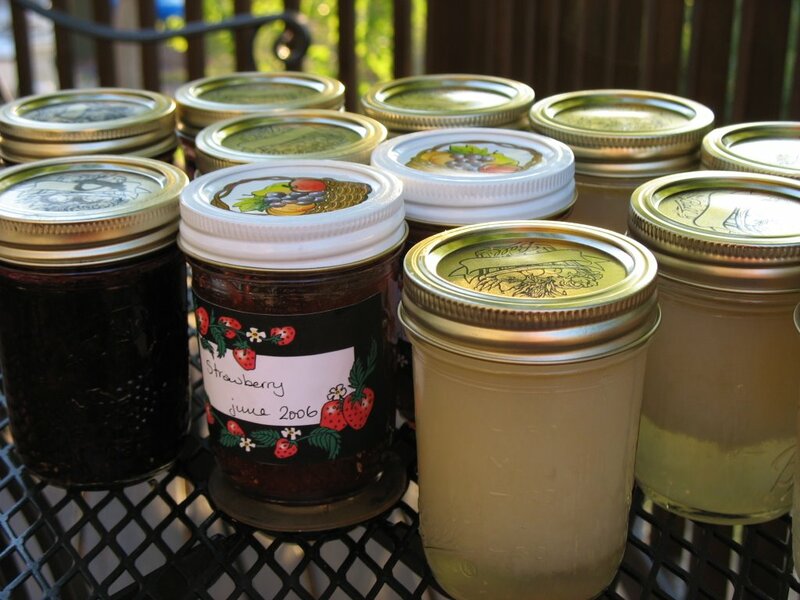 Cover with lids or cellophane and label the jars. Store in a cool, dark place for up to three months. The curd may separate out into two layers on standing, but just stir it around before use and all will be well. This looks wonderful and so home-made=the best!